One of the best fantasy films of all time has just become incredibly easy to revisit. 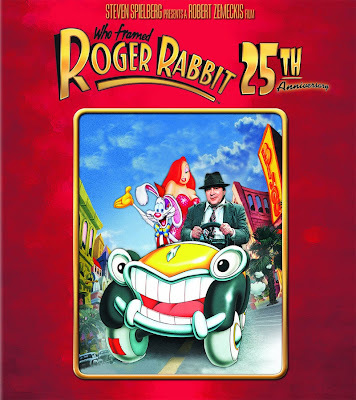 Many thanks to reader Josie Becker for a timely email alerting me to the awesome fact that Who Framed Roger Rabbit has arrived on Netflix for instant streaming! 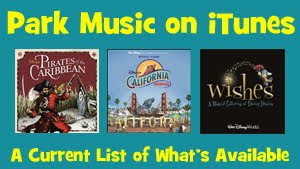 This is the fantastical murder mystery that made animation "cool" again in the eye of the general movie-going public. 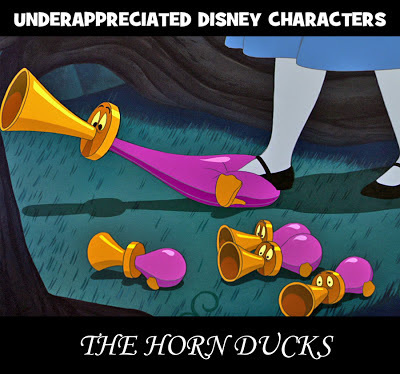 An incredible "what-if" alternate Hollywood history, it depicts a world where cartoon characters exist as a separate species hired for their ability to make humans laugh--while receiving no respect, gratitude or fair pay in return. How many of you saw Roger Rabbit for the first time in a theater on opening day? For the generation that grew up with The Bugs Bunny/Road Runner Show on Saturday mornings and Walt Disney's Wonderful World of Color on Sunday nights, this film became a communal celebration of everything we loved about the classic animation that had given us so much laughter. Even in my average-sized town, the theater exploded with cheers, guffaws and applause like I hadn't heard since the debut of Star Wars. In a very solid, welcome little update to their increasingly-awesome library of streaming Disney films, Netflix has just added Mulan and The Hunchback of Notre Dame, both excellent productions well worth seeing. And...oh, yeah...they also added the direct-to-video sequel Mulan II. We all remember Mulan II, right? Anyone? 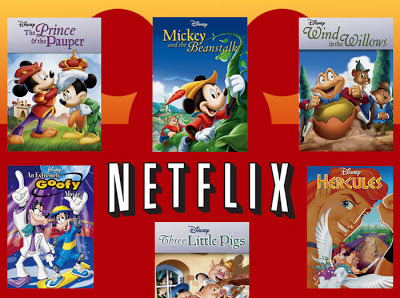 Bit by bit, the Netflix digital Disney catalog is becoming very impressive. 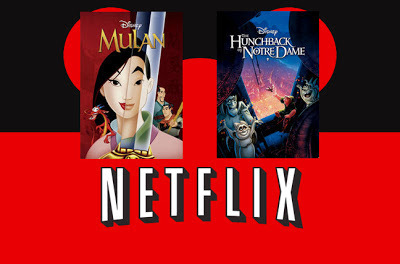 Check out our updated Disney on Netflix page for the full list of available classic animated films. 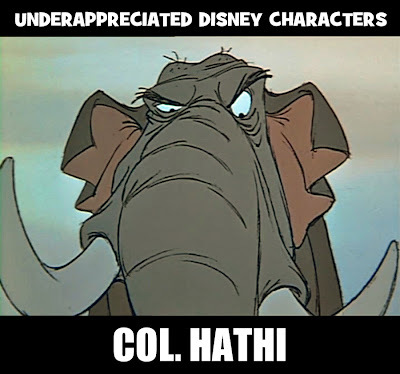 Voiced by the amazing J. Pat O'Malley (who also applied his perfect Stuffy-Elder-British-Officer impersonation to Alice in Wonderland and 101 Dalmations), Col. Hathi turns a minor plot moment in The Jungle Book into one of the funniest sequences in Disney filmdom. There's a nice bit of depth to this potentially one-note characterization: Beneath his gruff, loud exterior, Hathi cares very much about his young son. We also get the impression that, deep down inside, Hathi is well aware that he'd be helpless without the common sense input from his wife, Winifred. 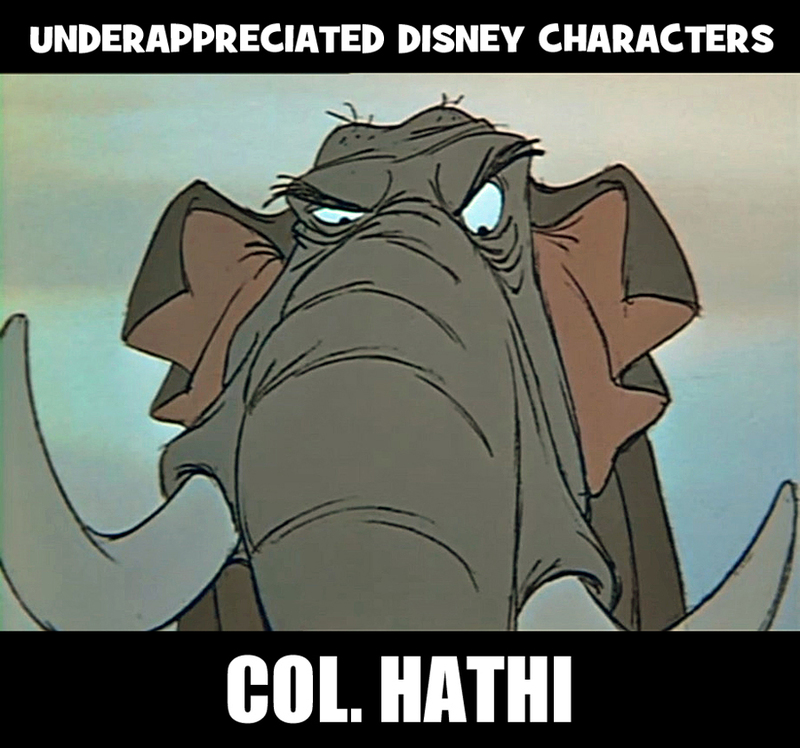 Col. Hathi once roamed the parks with Mowgli, long ago. 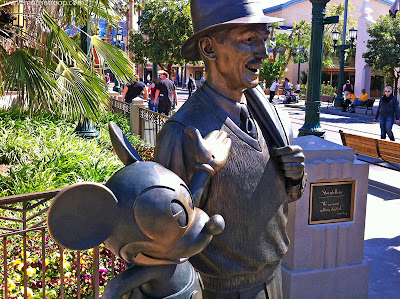 He used to appear in occasional parades, and was last seen doing a soft-shoe (with his twin) in a Goofy dream sequence in Disney's Twelve Days of Christmas. Somewhat out of character, but that's show biz. 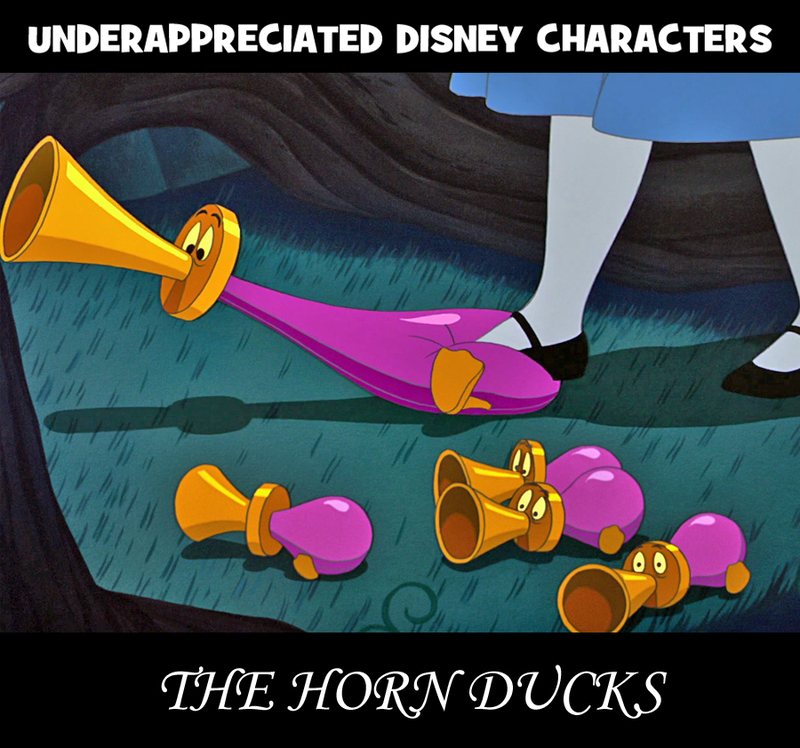 The Horn Ducks of Alice in Wonderland look so perfectly natural that it's truly a shame they don't exist in the real world. One of the most endearing species of Tulgey Wood, they express themselves quite well--and raucously--without speaking a word. 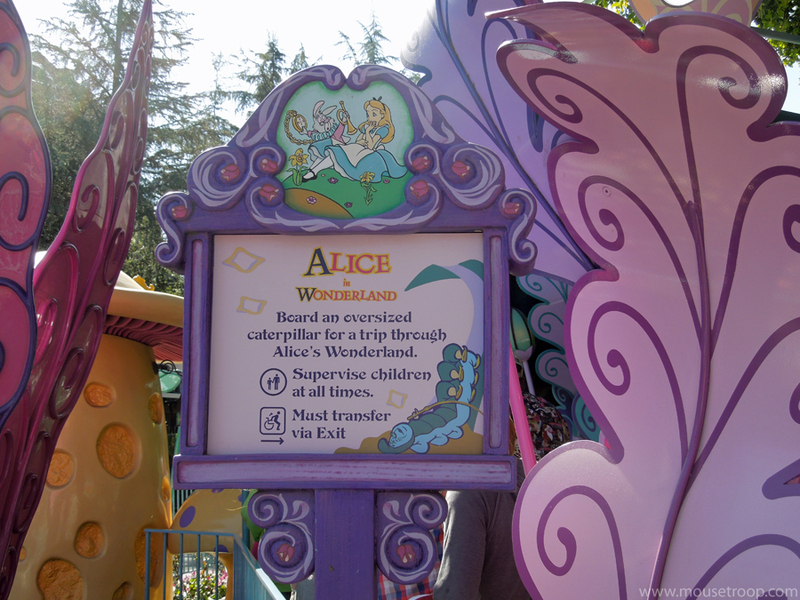 The Horn Ducks can be briefly glimpsed on Disneyland's Alice in Wonderland dark ride (don't blink!) and at Alice's Curious Labyrinth in Disneyland Paris. I'm a day late for The Enchanted Tiki Room's 50th birthday, but there's no time like the present for celebrating with a tribute to a Disneyland character you don't want to tick off. Walt Disney's willingness to stretch the boundaries of what the public would accept as popular entertainment was a lot bolder than most people assume. 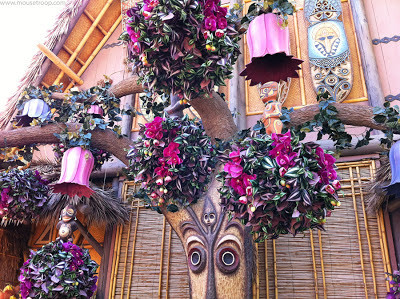 Exhibit A: Tangaroa, Father of All Gods and Goddesses, standing guard at the Tiki Room. 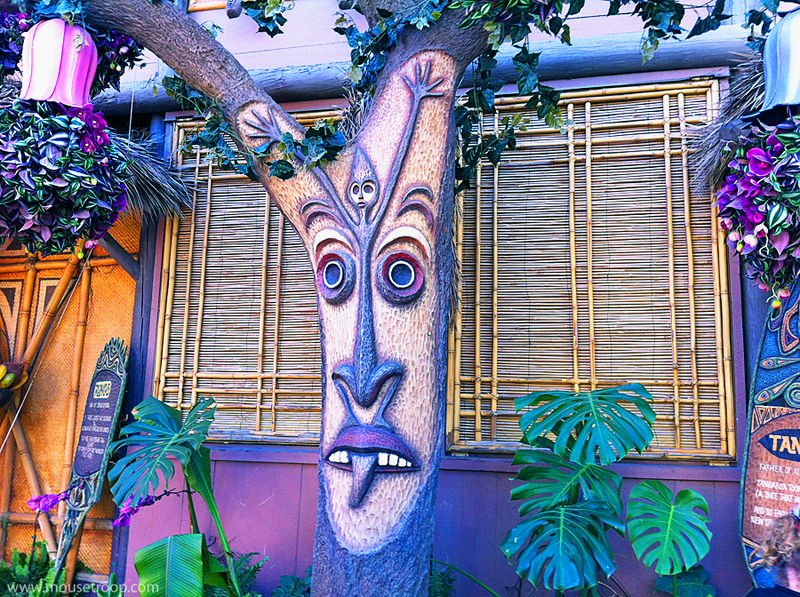 He isn't just a talking tree. He isn't just a talking tree with a unique nose. 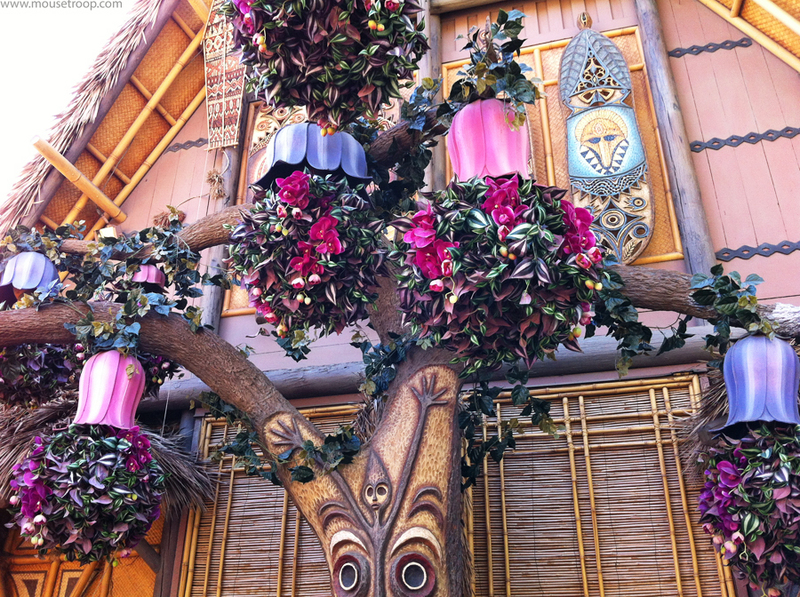 Voiced by the incomparable Thurl Ravenscroft, he's a male tree who gives birth in front of the waiting crowd! "Oh, Mystic Powers, hear my call! From my limbs, let new life fall!" He doesn't actually say, "Boo-yah." But he has every right to. This happy blooming has been taking place many times a day, nearly every day for fifty years. 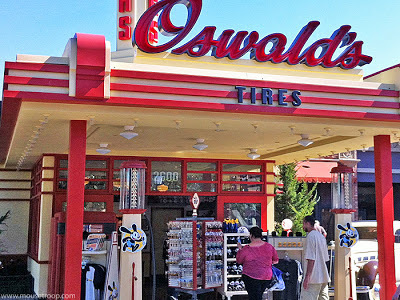 That's a lot of offspring, and just one of the many ways in which Disneyland takes guests further off the beaten path of everyday expectations than most people would ever guess. 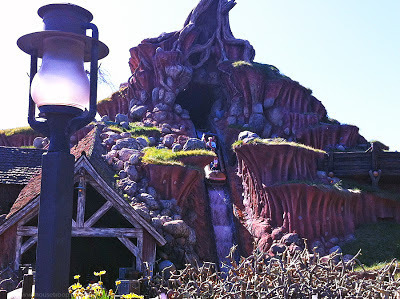 I don't ride Splash Mountain as often as I used to; The log boat remodel a few years ago turned the once-moderate final splash into a super soak-a-thon, so I now only take a chance if we're headed back to the hotel (in case a change into dry clothes is necessary). Even when I don't ride, however, I never tire of staring at this wonderful, magical work of imagination. If this were a real hill with a real rockslide, one would have to marvel at the strength of that old mill's roof! 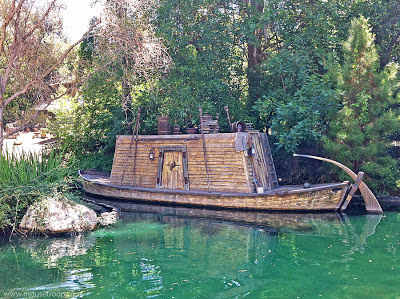 There she is, the best-named watercraft in the history of humankind, Mike Fink's notorious Gullywhumper from Davy Crockett and the River Pirates. 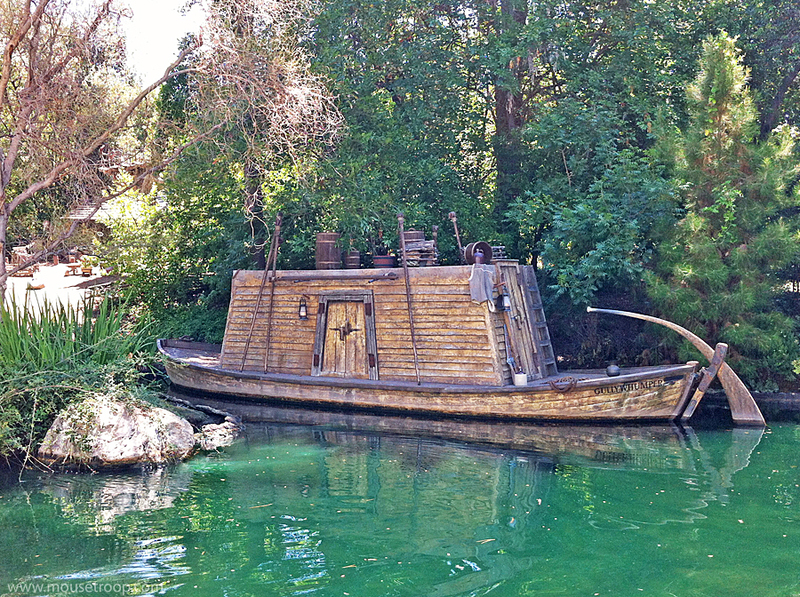 The days of braving Disneyland's Rivers of America aboard spunky keelboats are long past, but it's great to see this tribute to the disreputable vessel that inspired the old ride. She's moored, of course, at the "estate" of Mike Fink himself. Fink's your one-stop frontier markeplace for furs, gunpowder and antlers. And he won't try to cheat you, no sirree! 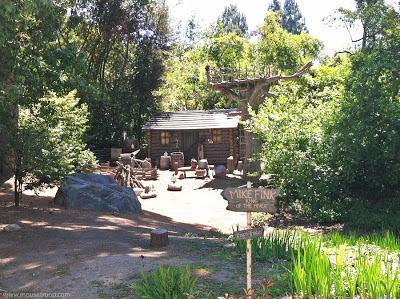 This was once the famous "burning settler's cabin" that startled many a youngster riding the Mark Twain Riverboat beyond the protection of Fort Wilderness. 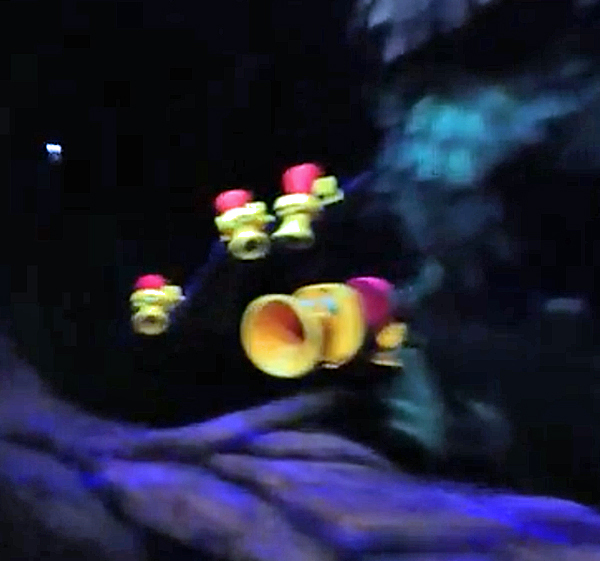 There are good and bad ways to remove a controversial and costly show element, and I can't think of a better solution than the one seen here: Replace it with a classic Disney scalawag and his trusty boat! 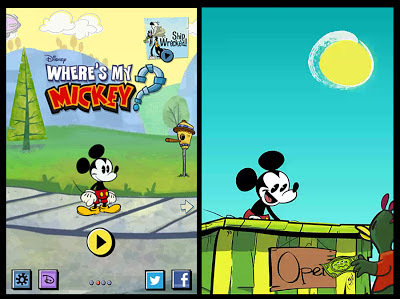 Review: The Mouse Goes Mobile in Where's My Mickey? This could be a case where I enjoy a game more than the TV source it's based on. 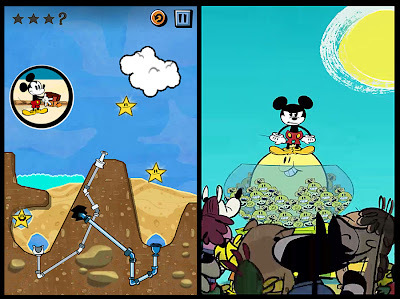 Aside from the fresh, fun art style, I'm not a big fan of what I've seen so far of the new Mickey Mouse cartoons coming to the Disney Channel. I'm hoping future installments are more charming and less mean-spirited, because I love the new visual approach. 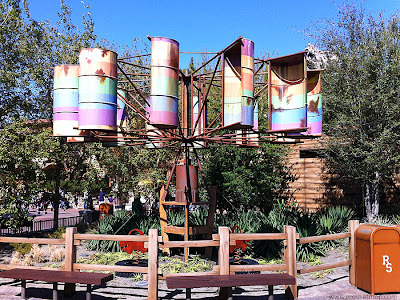 Welded together from cast-off oil barrels, this odd, quirky bit of Cars Land kinetic sculpture sits in a quiet corner of Fillmore's yard, just a few yards away from the hippy van's geodesic garage home. The horizontal windmill might simply represent the aging VW's artistic leanings. I wouldn't be surprised, however, to find it playing a role in the manufacturing of Fillmore's organic, non-petroleum home-brewed fuel. In the upper right, we can glimpse the top of Grizzly Peak, looking as if it's trying to take one tiny nibble of folk art. 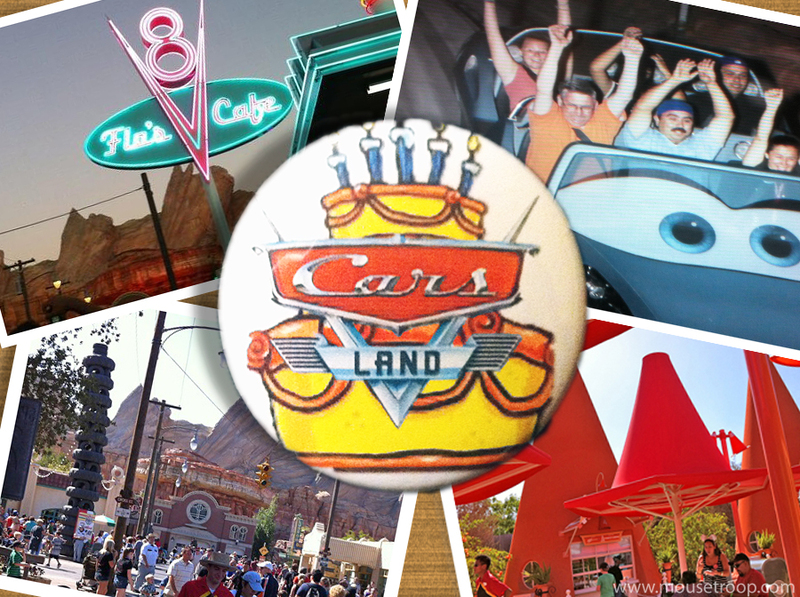 During the amazing June 2012 relaunch of Disney California Adventure, most media coverage focused on Cars Land (we wished it a Happy First Birthday this past Saturday). 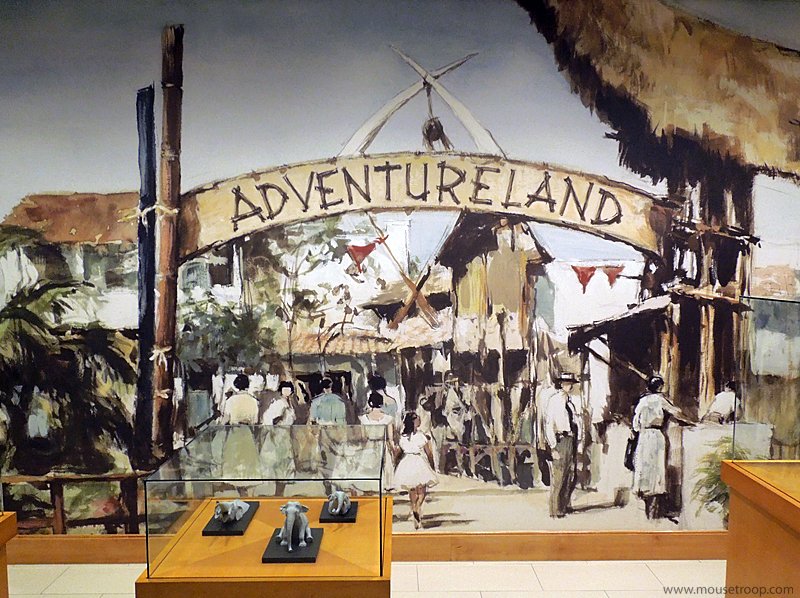 The other new land, Buena Vista Street, took a stalwart back seat while performing its vital role perfectly. 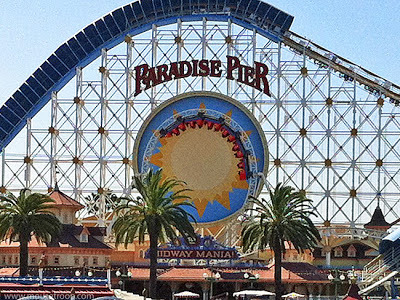 One year and two days ago, Disney California Adventure gained something it never had before: a heart. That's what Buena Vista Street brought to the park. Looking back at the Street's terrific first year at the resort, we're listing our Top Ten favorite elements the new land has brought to the reborn park. 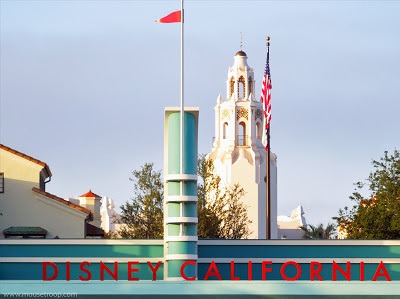 When DCA opened in 2001, its entry area, Sunshine Plaza, greeted arriving guests with a hodgepodge of pop culture imagery, a miniature Golden Gate Bridge, and an odd-looking sun fountain. To many, it came across as sterile and cynical. 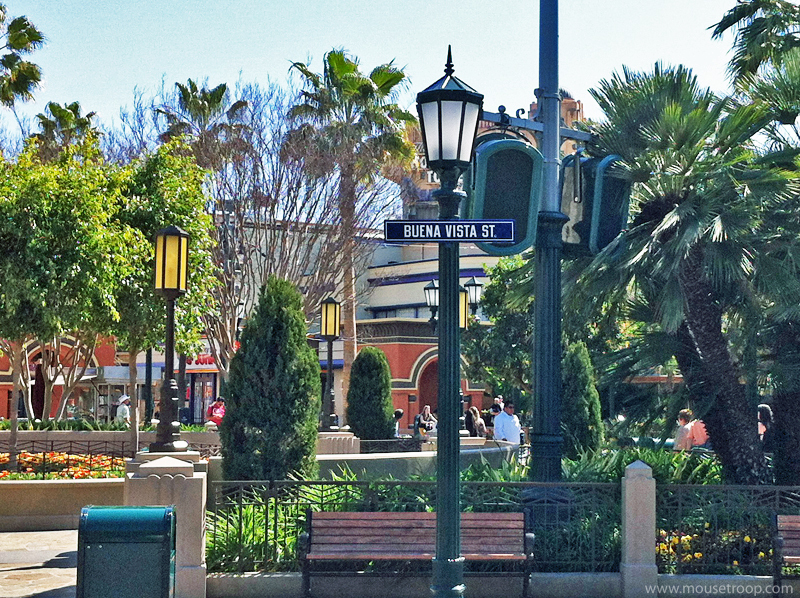 Buena Vista Street took its cue from Disneyland's Main Street and transformed DCA's entry land into a welcoming trip back to an idealized Old Los Angeles. 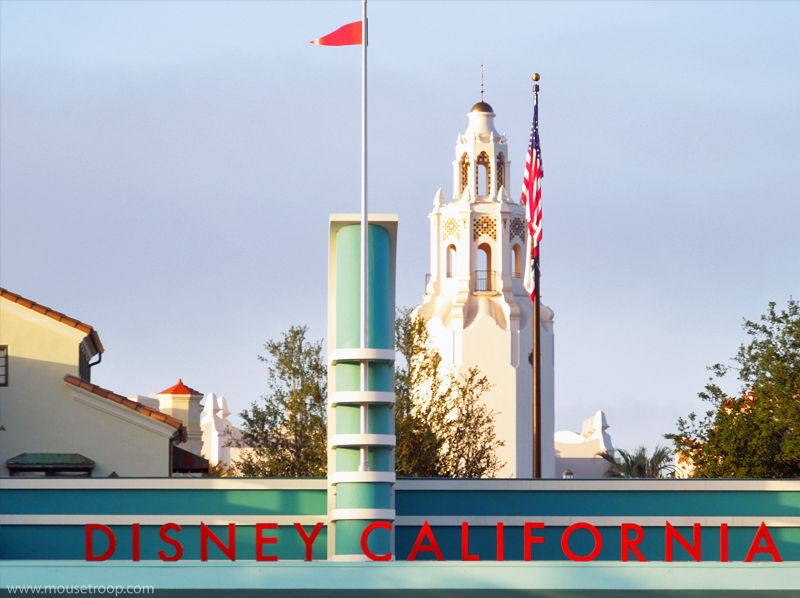 The relaxing, welcoming atmosphere, sparked with a theme of enterprise and enthusiasm, provides a perfect "home base" for a day at the revitalized DCA. 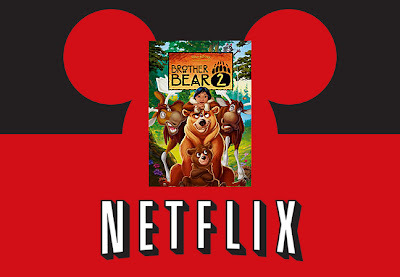 Disney's direct-to-video sequel, Brother Bear 2 has arrived on Netflix. After the recent flood of great classic Disney animation onto the digital streaming service, today's addition certainly seems anticlimactic all by its lonesome, but it's better than nothing. At least I hope it is...I haven't seen it yet. 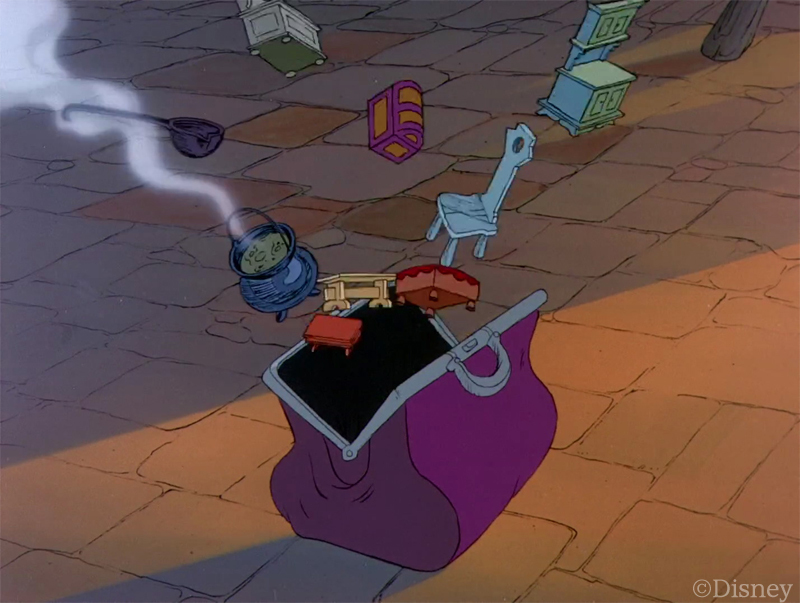 But--hey--It's gotta be better than Cinderella 2. 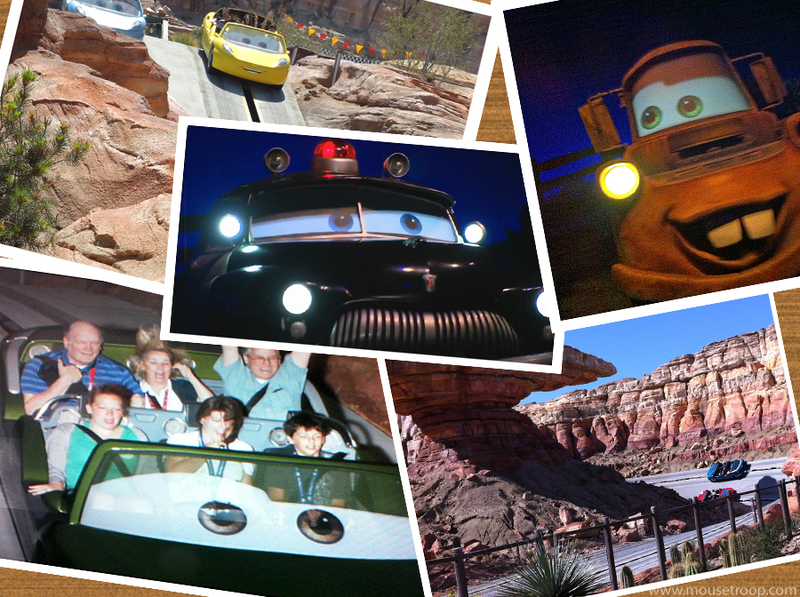 One year ago today, Cars Land opened to the public, rocketing Disneyland Resort into one of the most exciting and successful seasons in theme park history. Overnight, the once-ridiculed DCA became an outstanding full-day park and the entire resort began firing on all cylinders like never before. 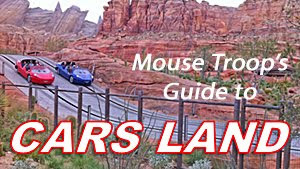 In honor of the land that saved an entire park, Mouse Troop happily presents the top ten reasons we find it tough to leave DCA's amazing automotive universe. Pictures and videos don't do justice to this enormous, amazing fantasy landscape. 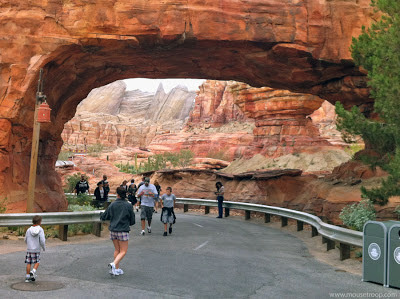 Although it's all part of Radiator Springs Racers, the rock work of Cars Land is also an attraction in itself--one that can be enjoyed at leisure by all guests. It's certainly the main reason we find it hard to tear ourselves away from the place. 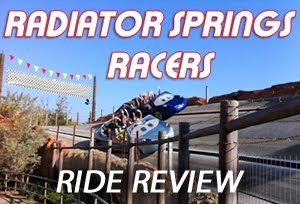 Currently our favorite ride on the planet, this masterpiece of humor, heart, thrills and joy isn't just a great ride--it completely succeeds at pulling you into the story and making you the main character in a quest to take part in Race Day at Radiator Springs. Absolutely amazing. 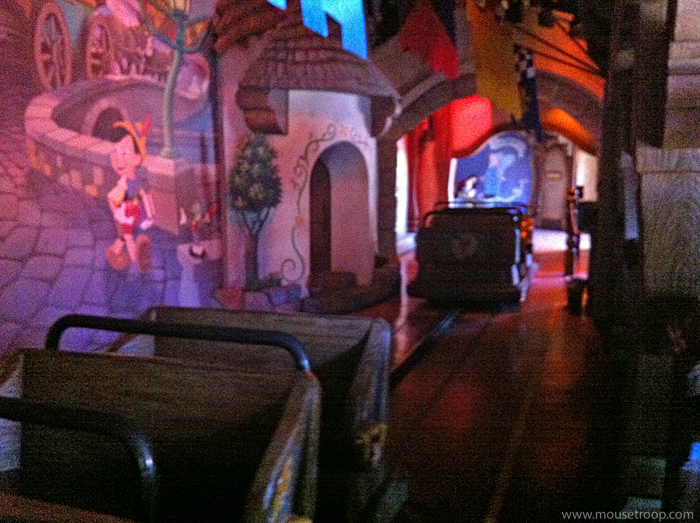 The Single Rider queue provides a great way to avoid the often two-plus hour waits. 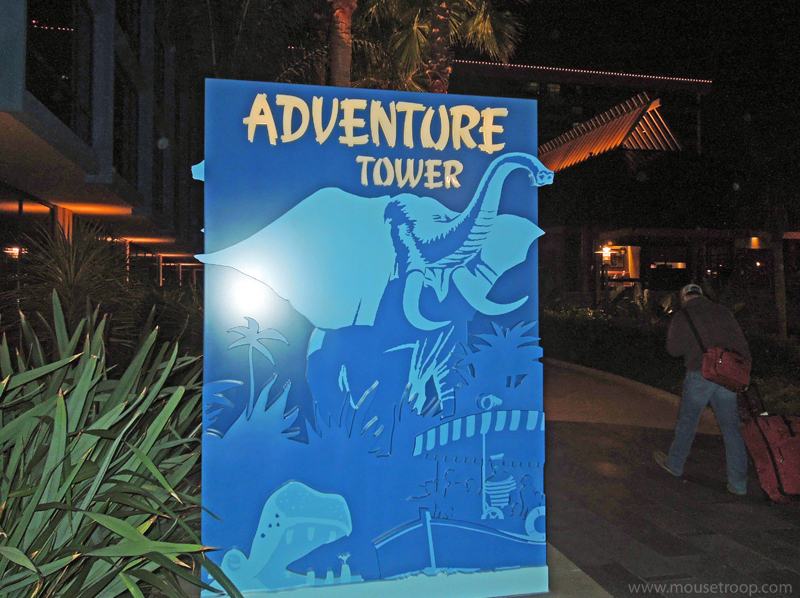 The Disneyland Hotel's towers are themed to three of the park's realms: Adventure, Fantasy and Frontier. 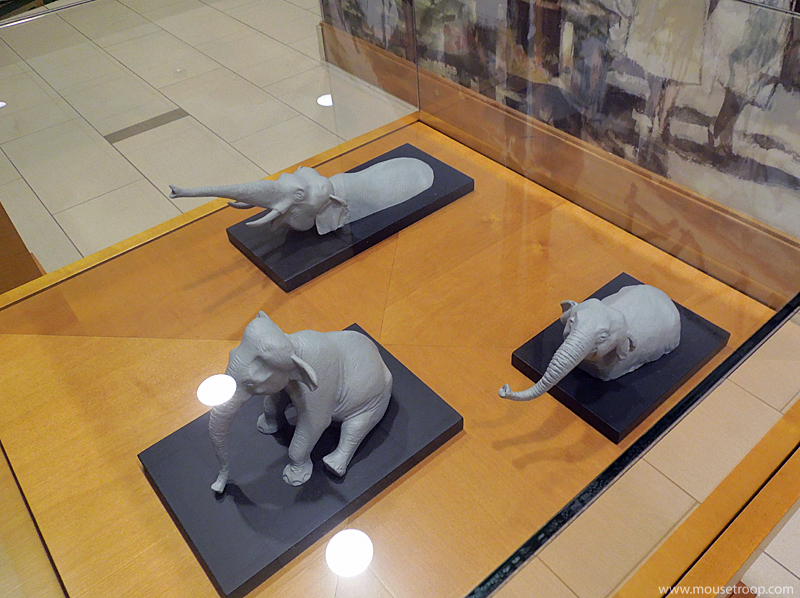 Each tower contains models and concept art relating to its namesake's development. Including these charming elephants, made slightly less charming by my amazing ability to place a ceiling light reflection in the worst possible spot. Mickey's been drawn, sculpted and digitized in many different styles over the decades, but my favorite versions of Walt's superstar graced the studio's early years. Here's a shot of the terrific old-fashioned promo art beckoning guests into the Main Street Cinema at Disneyland. This cheerful poster enlivens the base of DCA's Silly Symphony Swings. 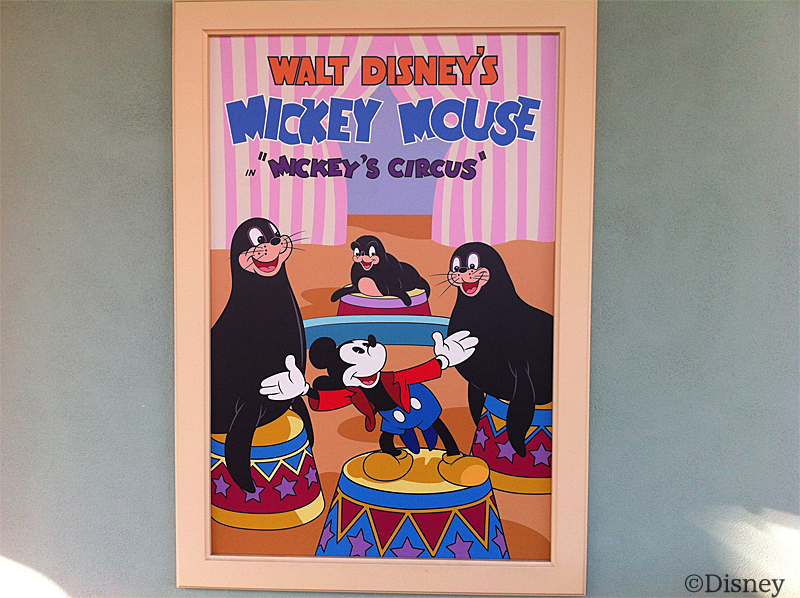 This may be my favorite bit of Mouse art ever. I know Mickey's not the tallest character on Earth, but--man, those are big seals. In Downtown Disney, the villain-themed room at the massive World of Disney store gets the most attention from true-blue Disney fans; Not only does it contain the best art collectibles, but it features some wildly inspired fixtures, including these creepy, wonderful...er...sconce-like things. 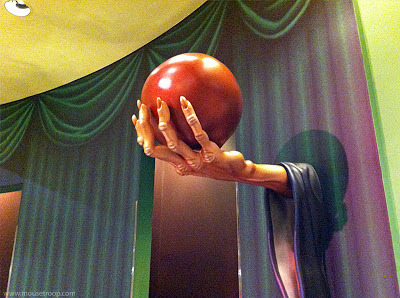 Each villain's personality is brilliantly summed up with a single hand holding a signature film prop. 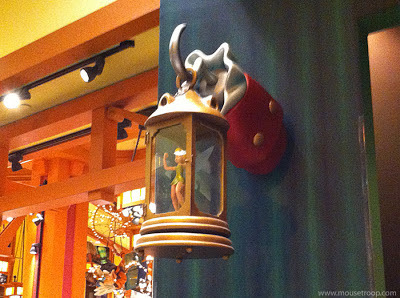 These just might be the coolest retail wall fixtures on the planet. Here's a burst of color for a June Sunday. 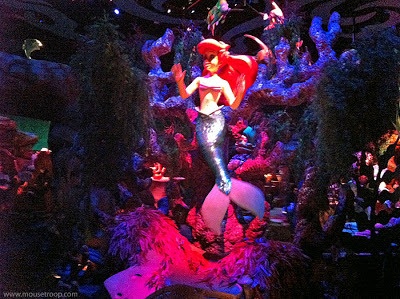 In a previous post, we've mentioned a couple of things we like and dislike about The Little Mermaid: Ariel's Undersea Adventure. 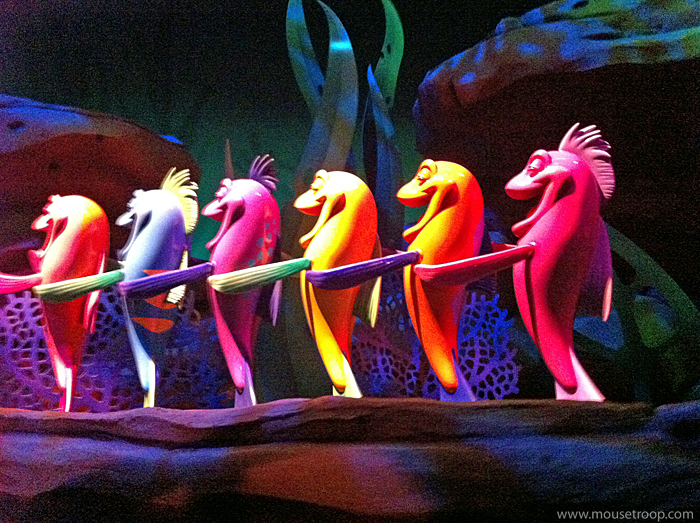 Today, let's simply enjoy the very best scene on the ride: The Under the Sea room. 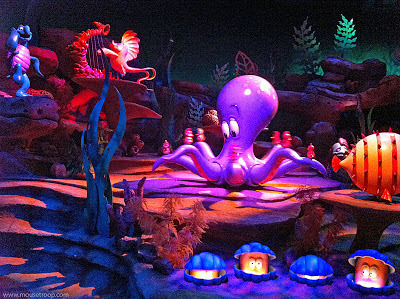 In this chamber, the Imagineers had to create one big, active environment based on a movie scene that's mostly composed of many quick, individual shots. This ride may not have much in the way of thrills, but it can certainly boast one heck of a cheerful centerpiece. Plus, it no longer features Dole-Whip-Hair Ariel (a horror Florida fans never had to encounter). 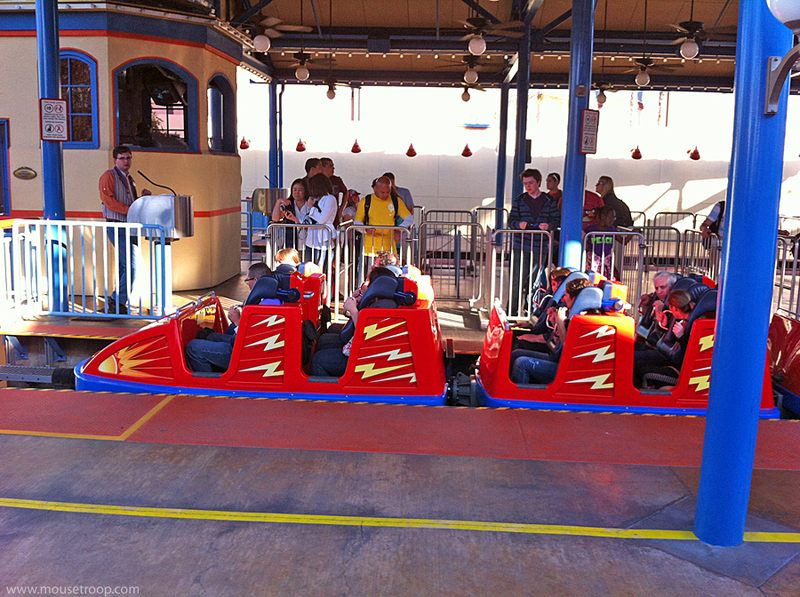 DCA's California Screamin' is one of the park's most efficient crowd-movers. With the ability to run five trains on the track at once, the massive coaster's wait times remain reasonable even on the busiest days. 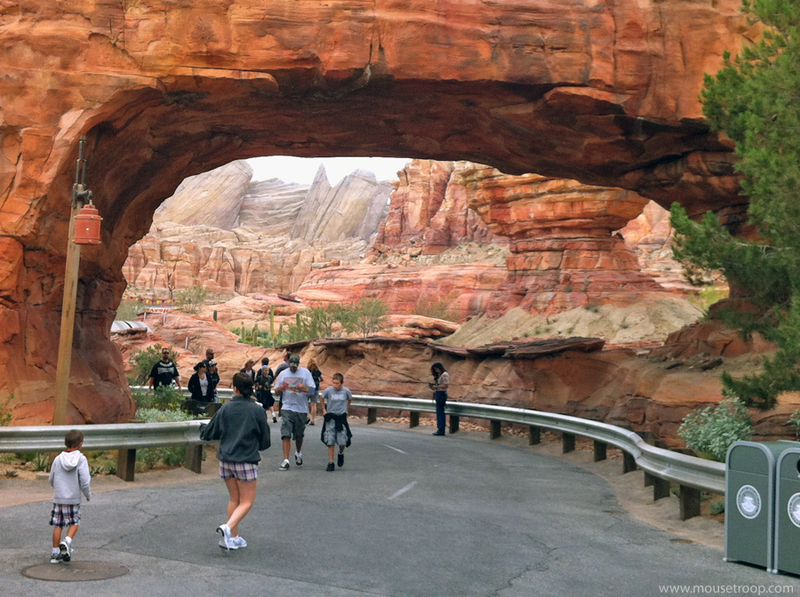 If you're touring the park solo, however (or don't mind temporarily splitting your group), the Single Rider Entry can cut your wait to just a few minutes! 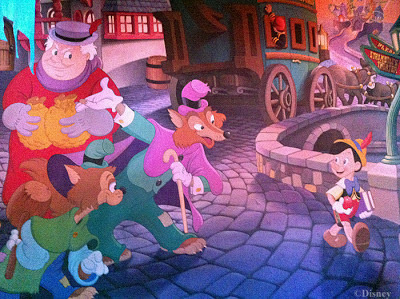 The Single Rider Entrance is to the left of the Standby Line. 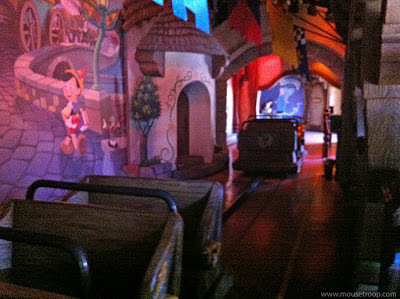 A cast member will direct you through to this area, which is actually the ride's unloading side. A moment later, you'll be directed to the right, where you'll take an elevator up to the queue's over-the-tracks bridge. 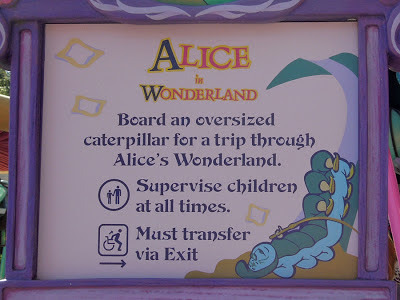 Is it really necessary to point out that the ride vehicles are oversized caterpillars? I honestly don't think anyone in line is expecting to board a normal-sized three-inch-long caterpillar...at least, I certainly hope not. 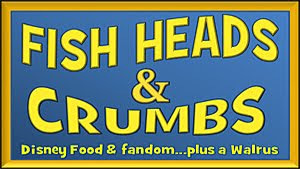 Ah, well, it's a fun bit of signage nevertheless. 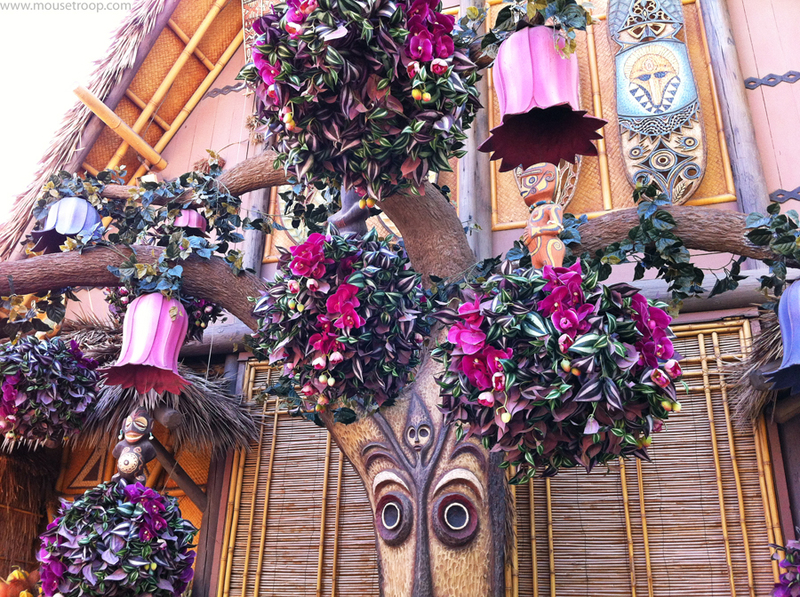 Imagineering Awesome at Mouse on the Mind! 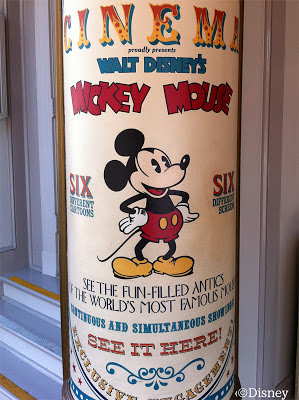 No regular post today, as Mouse Troop's gone visitin'! 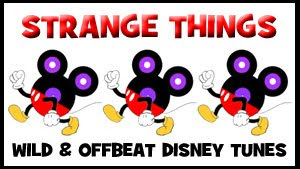 Today I have the great honor of taking part in a challenge set forth by Melissa Sue Sorrells at Mouse on the Mind! 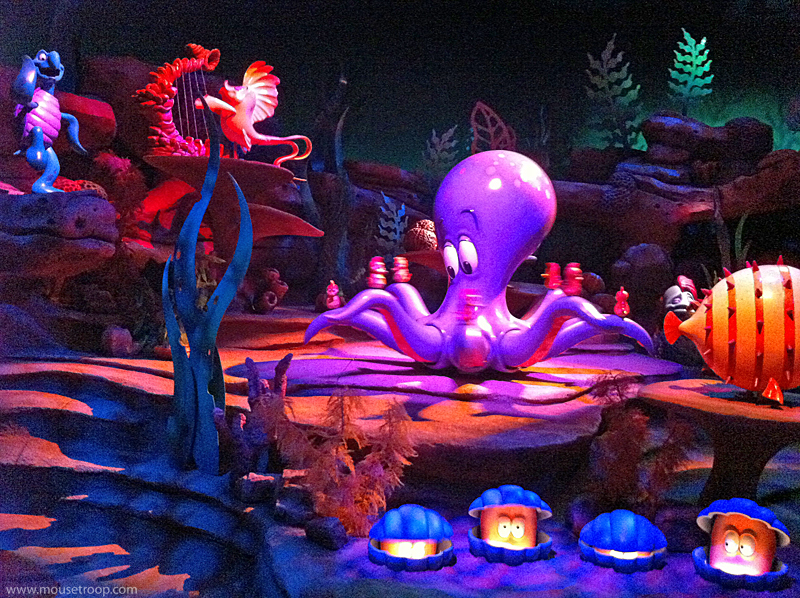 If you had the funds and authority to design any ride you wanted at any Disney park (it has to be based on a Disney film), what would it be? I know darn well what I'd build, and the above image is a hint. Head on over to Mouse on the Mind to check out the details of my dream ride. 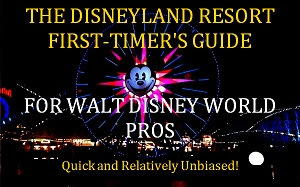 You should head over there anyway, because it's an incredibly creative, fantastic site full of great Walt Disney World travel tips, editorials, reviews and much more! "Kind of jumpy, aren't ya, Valiant? 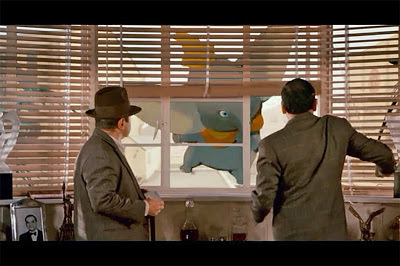 It's just Dumbo!" 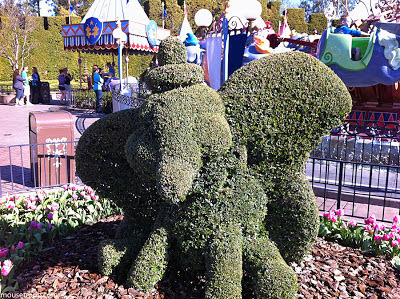 With that line from Roger Rabbit, we're taking a look at the cutest little shrub in Fantasyland. This great topiary sits all by himself a few yards from a whole herd of airborne pachyderms. He dreams of freeing his mother from the greenhouse, where she was locked up as a "mad plant." 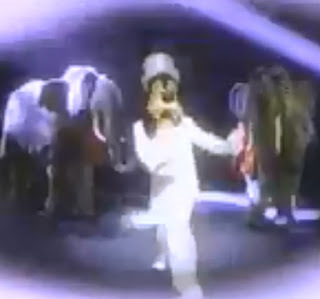 And he was the very last thing Jack Nicholson's character saw in The Shining. Okay, that's a lie--but you have to admit, it would have been a better ending. The Wind in the Willows, Paul Bunyan, Hercules, a lot of classic Mickey Mouse and rarely-seen gems like The Saga of Windwagon Smith are now available for digital streaming. 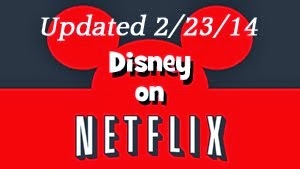 Today is a very good day to be a Disney fan with a Netflix account. 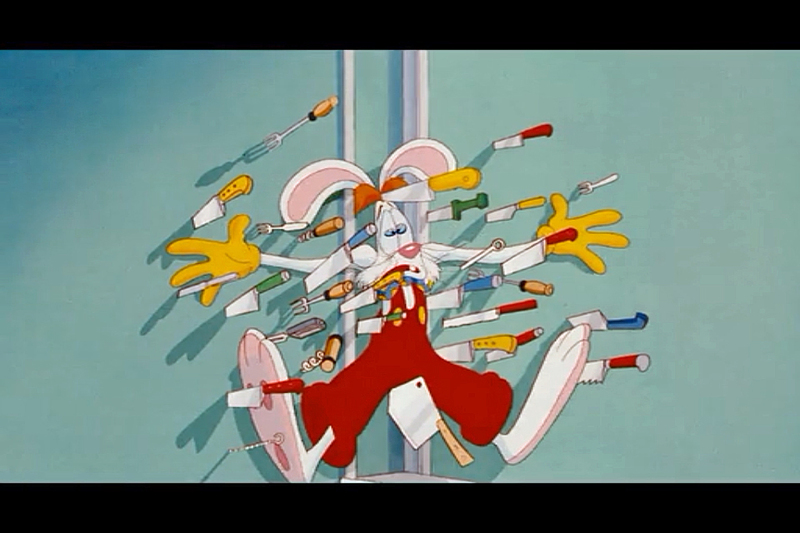 The streaming service just added a boatload of fantastic animation, including films that haven't been widely available for ages! Since last June, when DCA re-launched as a spectacular and satisfying park (at long last), many guests, particularly frequent-visitor locals and Annual Passholders, began approaching the resort with a new outlook. Many folks now treat Disneyland and DCA as one enormous mega-theme park. With the two halves facing each other, separated only by a one-minute walk across the central Esplanade, it's an easy mindset to embrace! 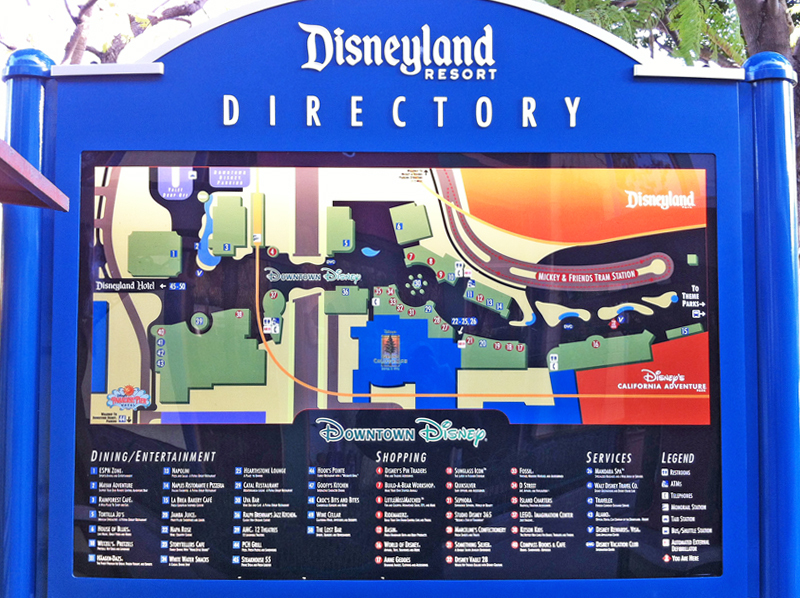 In this way of looking at the parks, the security bag check becomes the actual main entrance. The turnstyles at DL and DCA seem like mere formalities. 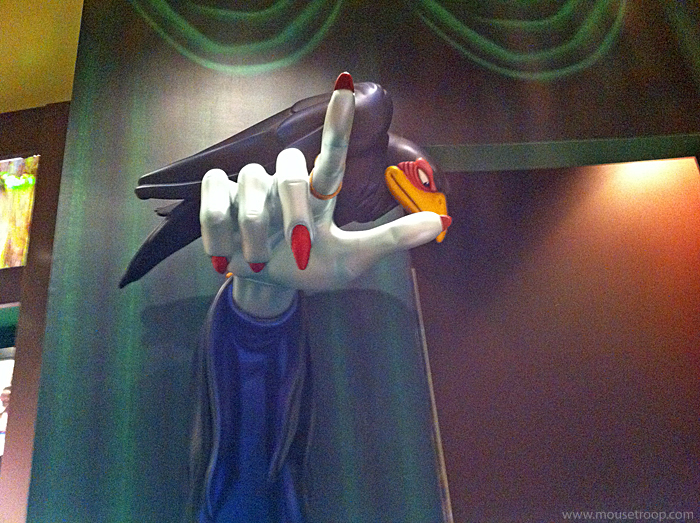 The five Fantasyland dark rides each have a unique style to their loading area, but all aim to provide a smooth transition from the (relatively) real world to the glowing black-light realms inside the building. At Pinocchio's Daring Journey, we feel as if we're entering a picture book that's springing to life, with three-dimensional set pieces emerging from background paintings.